Lemongrass, turmeric and ginger macarons! All naturally coloured from the spices! 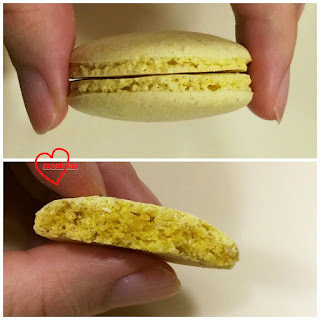 I was inspired by someone from a macaron group to try this flavour out. Since no recipe was shared, I thought I just give it a try based on my experience with baking spiced cookies. I went easy on the ginger here as I didn't want it to be too spicy so even kids are able to take it. You may increase the amount of ginger if you like it spicier. But I must say that the proportion I suggested is a good balance. A great home chef tasted it and said that it's got to be his favourite macaron flavour because it's savoury and hits that umami sweetspot. If you are a fan of aromatic spices, you will love this treat! This is the liquid egg whites that I tried straight from the carton. It took longer to whip to stiff peaks than regular egg whites even though I used a higher speed than usual. I also find that the batter tends to be wetter than usual. So my advice is if you want to use liquid egg whites, try using the Swiss or Italian methods where the egg whites are partially cooked. 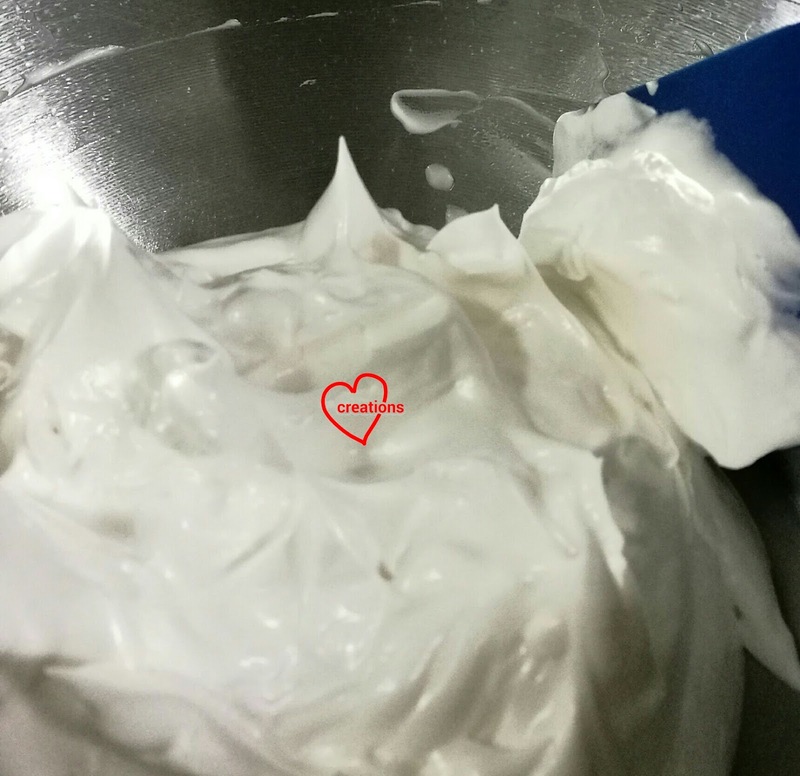 If you want to be lazy and use the French method like I did, be prepared to increase drying time or increase the proportion of almond and icing sugar to counter the increase in water content of the egg whites. Use more icing sugar and almond flour than I suggested in this recipe to be on the safe side. But if you are game enough, my recipe here yields a fantastic texture. 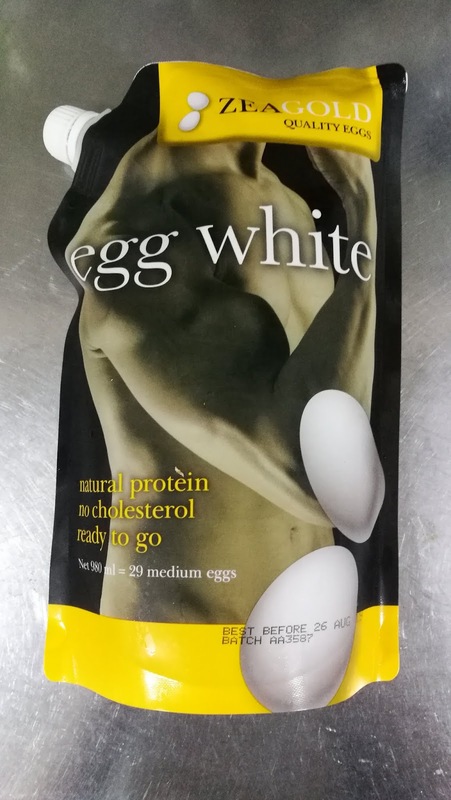 Taste and texture wise there is no difference between using liquid egg whites and using fresh eggs so if you don't want to have to deal with excess egg yolks, this would be a great option. Just keep in mind the differences in working with liquid egg whites and fresh egg whites that I mentioned above. 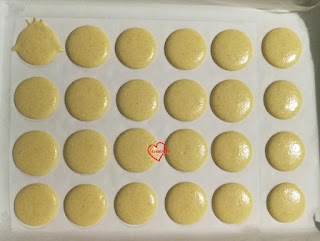 You may refer to this video tutorial that I made for the showing the techniques involved in making macarons using the French merhod. 1. Line baking tray with parchment paper. Place a template below if you wish. Set oven rack to lowest position. 2. Sift together all powdered ingredients. Set aside. 3. Make the meringue. Beat egg whites and cream of tartar until foamy. Gradually add caster sugar and cornflour and beat until stiff peaks form. 4. Scatter half of dried ingredients over meringue and gently fold until almost incorporated. Add in the rest of the dried ingredients. Gently fold until totally incorporated. Fold and press the batter against the sides of the bowl to deflate some air. Test the consistency often. Once the batter is able to fall off spatula in an almost continuous manner like ribbon and any peaks in the bowl melt back in when you tap the bottom of the bowl, stop folding. 5. Transfer batter into piping bag fitted with a Wilton #10 or #12 tip. Pipe rounds...Or if you wish, do the little chick design. This chick design will appear in my upcoming book too except it will look prettier. I was lazy and used edible marker to decorate everything. 6. Bang tray on table hard a few times to release any trapped air bubbles. Let the shells dry in air-con room or under a fan until they are dry to touch. 7. 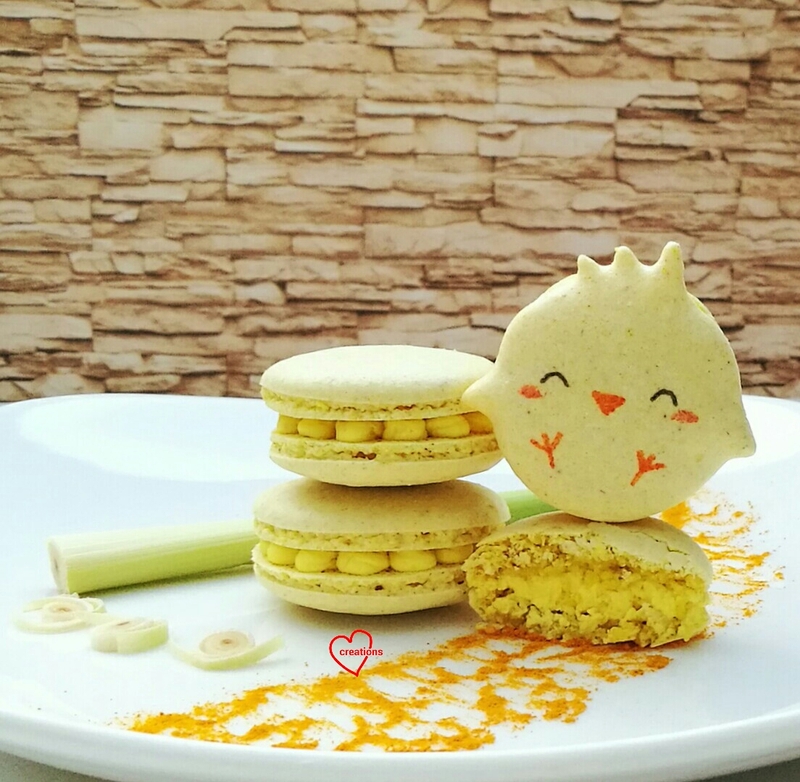 Bake in preheated oven at 150℃ for the first 10 min and reduce temperature to 130℃ and bake for another 5-10 min. Note that each oven is different so adjust the temperature and time accordingly. Freshly baked shells! Checkout the awesome feet and full and fluffy insides! Texture wise is perfect too. Crisp and thin outer layer and soft chewy interior! * I used a combination of dried and fresh lemongrass as they impart a different aroma and flavour. The dried lemongrass has a more earthy flavour whereas the fresh lemongrass has a sharper, more refreshing flavour. You may stick to either one if you wish. 1. Heat up about 50-60g whipping cream until it starts to bubble. Steep the chopped fresh lemongrass and dried lemongrass for 10 minutes. Sieve the cream and weigh out 20-25g (more if you prefer softer ganache and less if you prefer firmer). Squeeze as much cream out of the lemongrass as possible to extract as much flavour as you can. 2. Place white chocolate, unsalted butter, lemongrass flavoured whipping cream and salt in a microwave safe bowl. Heat for 20 seconds at medium power. Mix well with spatula. Repeat heating and mixing until totally melted. 3. Add tumeric and ginger powder and mix well. 4. Chill the ganache in freezer for 2 minutes. Mix well with spatula. Repeat freezing and mixing until you are able to whip the ganache to buttercream consistency. 5. Transfer to piping bag and fill the shells. Refrigerate filled shells for at least 24h before serving. 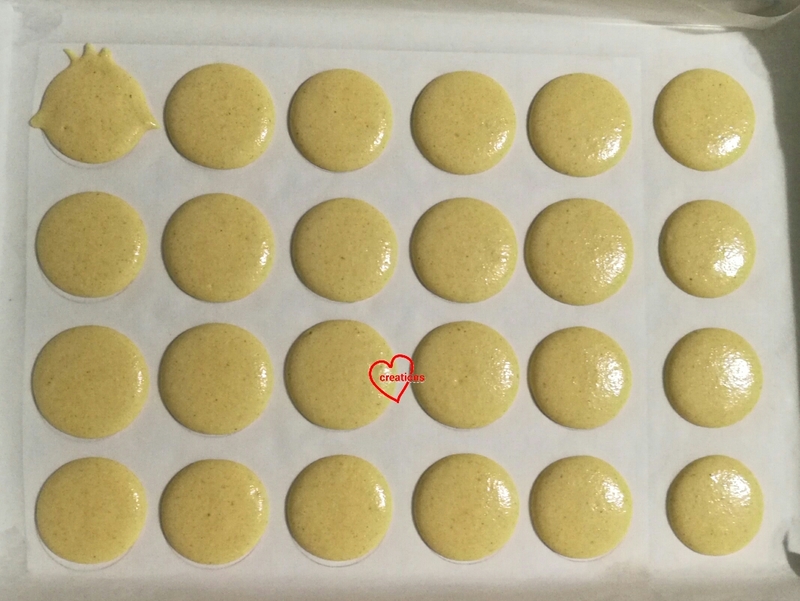 Leave the macarons out at room temperature for 10 min before eating. Besides being yummy, lemongrass, turmeric and ginger have great health benefits too! You can google for the information easily so I shall not put it here.